Perhaps taking a cue from the Bollywood movie ‘Andaaz Apna Apna’, three young men robbed several city residents of their belongings after threatening them with an air gun and a button knife. However, the trick did not work this time for Lovepreet Singh alias Lovely, Inderjeet alias Pandey and Rajan Singh alias Mani, who were arrested by the city police late last night near Jain School, Jamalpur, following a trap laid to nab them. Just before being caught the trio had robbed a taxi driver, Kulwant Singh, of Rs 1,000 and his mobile phone at ‘air gun point’ near Jamalpur. A Tata Indica, ten cellphones, one button knife and an air gun that the three used in several robberies and snatchings were recovered from them along with some cash. According to police officials, the trio had been involved in a number of robbery and snatching cases over the past few days. The crimes were usually committed at night around Jamalpur, Chandigarh Road and Focal Point. "Their modus operandi was simple. They parked their car on one side of the street at night. As and when they saw an unsuspecting passerby on the road, the suspects waylaid him and robbed him of his belongings, including his mobile phone and cash. They used the air gun and button knife to threaten and scare their victims," said Jamalpur police station SHO Kanwarjeet Singh. Lovely, a resident of Dhillon Nagar, Simlapuri, is the son of a bank field officer. Inderjeet Singh and Rajan Singh are both residents of Basant Nagar. The three youths, in their early twenties, are said to be drug addicts and used to rob people to pay for their addiction. "The suspects don’t appear to be very well educated. They used to spend the cash robbed from the victims on drugs and sold the mobile phones to their acquaintances instead of shops," said Kanwarjeet. Meanwhile, Lovely told the cops the Indica car used in the crimes was given to him by his father. However, the police suspects the three might have stolen the vehicle from an unknown location. "Investigations in the case are on and we are hopeful to crack a number of snatchings and robberies after a detailed interrogation of the suspects," said ADCP Harjinder Singh Sandhu. He added the police had earlier registered a case of theft against the three youths at the Mohali police station. “The suspects had even been arrested in Mohali about a month ago. They were released from prison only a few days ago following which they were involved in several snatching incidents in the city within a short span," Sandhu stated. Meanwehile, a case under sections 25, 54 and 59A of the IPC has been filed against the suspects at the Jamalpur police station. In what could be termed as the most "absurd" incident, a senior doctor from Dayanand Medical College and Hospital (DMCH) was challaned for jumping the "non- functional " traffic lights. But what was more shocking was that there was no traffic cop for manual monitoring of the traffic at the intersection. This is not the sole case where the high-handed attitude of the traffic cops has come to the fore. There have been many incidents wherein innocent public have been subjected to harassment at the hands of traffic cops on a routine basis. On one hand, the cops go overboard to meet their targets by challaning maximum people for violation of traffic norms and at the same time they just love to oblige the "influential lot" who are amongst the habitual offenders when it comes to traffic rules. opposite Preet cinema in his Swift car no. PB-10CB-0686 last week when a cop in a police pilot gypsy stopped him and handed over the challan. The harassed doctor while trying to reason out with the traffic cops stated that the traffic lights had been non-functional for the past two months, so to challan him was not right to which another constable defended the action initiated by his senior. He said the Ludhiana Municipal Corporation was responsible for maintaining the traffic lights and it did not concern the Traffic Department. To add to the annoyance of the doctor, the cops issued the challan for June 16 that was an official holiday of the Punjab government. “I went to the District Transport Office on June 16, it closed and I was asked to come on June 17. But the challan was not dealt with on the given date too and I was again called today on the pretext that the challan was not entered in the data of the computer,” rued the doctor. The Ludhiana district administration will accord a warm reception to the Queen's Baton Relay on its arrival in the city on June 26. The relay is being carried out in connection with the forthcoming Commonwealth Games slated to be held towards the end of this year in New Delhi. Deputy Commissioner, Ludhiana, Rahul Tewari who is also the chairman of the District Olympics Association, chaired the meeting of officials of the district administration, convened today to review the arrangements being made to receive the baton. "After travelling 70 countries across the globe in 340 days, the Queen's baton relay would enter India from the Wagah border on June 25 and proceed towards different cities," he said. Employing women on “compassionate grounds” for a job that can often be dangerous has put the municipal corporation in a dilemma. The 40 female relatives of employees who lost their lives while cleaning sewers, are unable to get down into the sewer manholes and clean the choked pipes. While the civic body is paying their wages it does not know how to utilise their services. It has, however, assigned them duties in other departments, but in the meantime the sewer cleaning work has been suffering on account of the acute staff shortage. The situation has assumed urgency ahead of the monsoon, when the MC is faced with the task of cleaning all the drains in the city. wives who have found the task virtually impossible to perform. According to an estimate, about 350 sewer men had been employed by the civic body in all the four city zones to clean the sewerage and drainage systems. Since the MC did not provide them with necessary kits having oxygen masks, many sewer men lost their lives due to asphyxia. 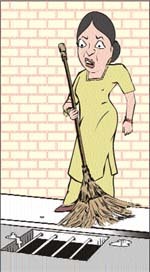 "The civic body continues to be faced by an acute shortage of sweepers and sewer men. The latter have to go into manholes to clean sewage lines. Now about 40 females have been hired for the job on compassionate grounds. However, women shouldn’t be assigned this work. Moreover, they aren’t fit to do this kind of work. Only men can do the dangerous and tedious manual work involved in cleaning sewers. The MC has to find a way out to solve this problem, otherwise it will always have to hire workers on contract basis", said Congress councillor Parminder Mehta. "The situation cannot improved unless the state government fills vacancies of regular workers", he added. According to data available with the MC, 14 women have been hired as sweepers against the posts of sewer men in zone D on “compassionate grounds”. Similarly, in zone A 14 females have been hired, 9 women are working in zone B while in zone C four women are looking after the work of sewer men. MC additional commissioner KPS Brar admitted many of women were hired for cleaning sewers. “In most of these cases their children are too small. Some of the sewer men who died on duty had no male child but the job had to be assigned. However, we don’t let the work to suffer. We hire extra sewer men during the monsoon on a contractual basis”, said Brar. Making pigeons perform in his magic shows without registering these with the Animal Welfare Board of India (AWBI) has put the magician Shankar Samrat in trouble with animal rights activists demanding an action against him for flouting rules. The AWBI has written a letter to Police Commissioner Ishwar Singh asking him to take action against the magician for violating the Performing Animals (Registration) Rules, 2001, (as amended in 2002) Prevention of Cruelty to Animals Act, 1960 (as amended in 1982), Transport of Animals Rules 2001and other rules for not registering the birds and animals with the board. The Assistant Secretary of AWBI, in his letter stated that the board received reliable information from the animal welfare activists stating that the magician was displaying pigeons and other animals in his magic shows being organised at Shingaar Cinema in the city. "The animals that perform or are exhibited must be registered with the Animal Welfare Board of India under Performing Animals (Registration) Rules, 2001 (as amended in 2002). Samrat has not sought any prior registration from the Animal Welfare Board of India for making the animals perform in the magic show and the animals are also not registered with the Prescribed Authority, AWBI’’ reads the letter. Ishwar Singh said he did not know anything abut the controversy. He said he was not aware whether the AWBI had demanded any action against the magician or not. Meanwhile, Shankar expressed ignorance about the registration process of birds to be displayed during public performances. She captures the subject matter's essence in a few eloquent strokes. Each brush stroke is a meaningful gesture in dialogue with those that have come before and after it. She evokes beauty and emotion in her every stroke, which invites the viewer not only into itself but also the space in and around it. 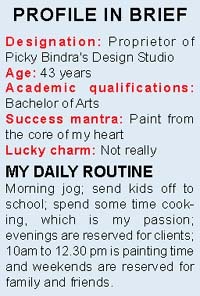 Picky Bindra, an artist, is essaying her thoughts and ideas on a canvas in a contemporary manner. 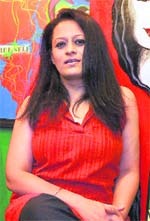 Her paintings today can be seen displayed at offices of big national and international corporate houses. Citibank held an exhibition of her paintings, which are displayed at their various branches. Picky's creativity is not only restricted to canvas, but extends to intricate designs on wooden furniture. She has also been associated with famous fashion designer Reena Dhaka for quite some time for doing hand pain ting on her clutches and purses. It was after a gap of a decade-and-a-half that Picky resumed painting. How, according to her, does Indian art figure on the world scene? "Western auction houses and art galleries have suddenly become interested in contemporary Indian art in the past few years. The increasing globalisation has its effects not only on the economies of nations but has shown its impact on the art of the particular nation. "With the increasing globalisation of contemporary art market, collectors, curators and auction houses have over the last few years turned their attention to art from 'emerging economies.' Lately, there have been major Indian shows in London and their success indicates that this interest is here to stay," beams Picky. Ludhiana has gradually grown up to appreciate art. "Since I deal with abstract form, my clients include only those who are ardent lovers of art and understand it from the core. Initially, people use to buy figurative and nature-based art forms but now the scenario is changing. People are accepting the abstract form. While some actually understand it others buy it just for the sake of following the trend. Apart from corporate houses, my clients also include the general public for whom I paint on order," says gorgeous Picky. How big is the international market for the Indian art today? Picky, whose buyers include national as well as international buyers, says, "The buyers for the Indian contemporary art are becoming increasingly global. Top Indian contemporary artists such as TV Santhosh, Atil Dodiya, Thukral and Thagra employ techniques and explore themes that appeal to western audiences while maintaining an inherent Indian quality at the same time". Recollecting the progression of the contemporary Indian art market, she said it had changed beyond recognition. International galleries are now operating out of Mumbai, Delhi, Berlin, London and New York, while auction houses regularly offer Indian art within the context of western contemporary art sales. This has undoubtedly helped in making the collector- base international. "There is a stable of young contemporary artists who have truly established themselves as a force to reckon with on the international-art scene. Picky feels that it is an ideal time to buy the Indian contemporary art with the Indian economy predicted to grow at a faster rate than the more established western economies, "Despite the recession, the contemporary Indian art has continued to capture the imagination of international collectors. Major exhibitions in London and the inclusion of some of the leading Indian contemporary artists in the western gallery shows prove that the Indian art is now able to stand shoulder-to-shoulder with its more established western counterparts on the global stage. The Indian contemporary art market should see sensible sustainable growth in the years to come. Picky who is currently into abstract art will soon start painting figurative as well is all praise for the Indian art, which is enjoying a remarkable period in its history. "The growth in this dynamic market has been characterised by increasing interest in more traditional Indian art forms as well as the continual growth of modern and contemporary art," said Picky with a broad smile. The steel and induction furnace industry has strongly reacted to the weekly offs imposed on it. According to the new directions by Powercom, a two-day power cut will be imposed in a week on induction furnaces and rolling mills. In addition, peak hours load restrictions, which are for three hours per day, will also be imposed on steel producers, including induction furnace and rolling mills. Sanjeev Garg, past president, North India Induction Furnace Association, said it was the biggest blow to the industry. "Industry is already reeling under the labour shortage and the cuts will further aggravate the situation. "Now labour will sit free, which will also prove negative for the industry," he said. The worst hit is the furnace industry of Mandi Gobindgarh, as it has been instructed to observe a weekly off with immediate effect. A member of the Mandi Gobindgarh Induction Furnace Association member said Powercom should have given a prior notice or discussed the matter with the industry beforehand. "In addition to the number of problems, power cuts will only add to the injury," he added. Sanjeev Gupta from induction furnace industry added due that to wrong policies of the government, industry was already shifting its base. "When we started industry in the city there was surplus power but now the situation is worsening with each passing day. In the coming time, I feel Punjab will be only confined to agriculture and industry will either close down or shift its base," he added. The power situation has worsened in the wake of the ongoing demand for energy from the farm sector, as farmers are in the process of sowing paddy across the state in the ongoing kharif season. Power utility has committed to supplying eight hours of power to paddy growers. Following reports of violation of the Biomedical Waste (Management & Handling) Rules by several city hospitals, the Punjab Pollution Control Board has issued notices to Christian Medical College & Hospital, BL Kapoor Memorial Hospital, Bhagwan Ram Charitable Hospital and Sham Lal Aggarwal Charitable Hospital. Details procured by anti-corruption and crime investigation cell from the PPCB under the Right to information Act clearly points towards negligence on the part of officials of these hospitals authorities to get their ‘authorisation’ renewed by the board. At the same time, the PPCB officials in the Ludhiana zone too have adopted a nonchalant attitude as they had failed to initiate any check or action against the private hospitals for years. It is mandatory for every hospital to submit details of biomedical waste generated in the hospital under various categories, but PPCB records state CMCH had not submitted the required details after 2005. 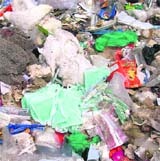 Rohit Sabharwal, president of the anti-corruption and crime investigation cell, stated there was clear evidence of the ongoing "indiscriminate" disposal of biomedical waste including tubes, disposable gowns, masks, scrubs, needles, syringes, wound dressings and even blood, by hospitals in the city but PPCB had done little to check these malpractices. "I’ve forwarded a complaint to the PPCB chairman and have also taken up the matter with the Punjab health secretary to take prompt action against flagrant violation of rules on disposal of biomedical waste," Sabharwal added. BL Kapoor Memorial Hospital has not applied for authorisation from PPCB under the biomedical waste (management and handling rules) during the past ten years. Some hospitals are not even aware of the fact that they have to get authorisation from the board and are indiscriminately disposing of biomedical waste. When contacted, officials in the PPCB zonal office in the city were at a loss of words. Refusing to dispense with details on the nature of action as mentioned in the information given to the anti-corruption and crime investigation cell, RK Goyal, PPCB senior environment engineer, Ludhiana, was unable to elaborate on the words "under process", repeatedly used in the documents provided by the board. "I’ve joined the board only recently and am not aware of the mater. But I’ll definitely take action against the erring hospitals after going through the records once I settle down," said Goyal. Christian Medical College & Hospital general superintendent Ashley Isaiah said the hospital had renewed the contract with Samramky, the firm authorised by PPCB to collect biomedical waste from hospitals. He denied having received any notice from the board for not having renewed PPCB authorisation, adding, "CMCH comes under the category of hospitals that have been given permanent authorisation by the board." Isaiah also stated there was “something wrong” with the PPCB norms as the board members at their last meeting had tried to “put pressure” on the hospital to sign an agreement with a specific company, which was charging higher rates than Samramky. “However, the hospital management had refused to do so”, he added. Waheguru Pal Singh, medical superintendent at BL Kapoor Memorial Hospital, claimed the hospital had already obtained authorisation from PPCB. “Board officials had recently come for inspection and had given the okay report. We’re complying with PPCB's prescribed norms for disposal of biomedical waste as we had signed an agreement with Samramky, which has been recently renewed, and PPCB has not issued us any notice for any violation so far”, he said. Summer camp at the Sutlej Club concluded last evening. A talk on Father's Day was the special attraction of the evening. Children were given chance to speak on the topic for one minute. Every participant spoke on the topic explaning their father's place in their lives. Lyrcial salsa, bachata and merengue were the other highlights of the evening. Glass painting, rendering, paper cutting and texturing were taught to the participants. Products of utility drawn out of the workshop were displayed in the club lobby on the final day of the summer camp. Pradeep Mandal and Seerat Gill, the experts from SIFT, guided children and motivated them to continue their creative skills in their free time after the workshop was over. Few parents, especially mothers, complimented the twosome from SIFT for tapping the hidden potential in their children. The parents were them selves surprised at the creativity of their children. Final year BCA students of the Regional Institute of Management and Technology, (RIMT) Mandi Gobindgarh, have come out with flying colours. While Garima Bansal bagged first position in PTU securing 94.4 per cent marks followed by Bhavna Bansal, who bagged third position in the university securing 93.7 per cent marks. Students were on cloud nine after the results were declared. Elated Garima credits her success to God, her undying efforts and dedicated teachers. Bhavna Bansal said it all had been possible due to the support of her parents and the teaching strategy at the institute. Director-General Dr BS Bhatia applauded the students and said that the result was a testimony to the quality education provided at the RIMT Group Of Institutes. RIMT Group of Institutes chairman Dr HC Bansal passed on good wishes to the students for their hard work and said that the students had made him feel proud. The PAU pensioners have called upon the state government to release the instalment of the dearness allowance relief of 8 per cent from January 1, 2010. RR Katyal, a retiree from the PAU in a statement issued today, said that the PAU comptroller in his recent notification issued to the deans, directors, head of the departments, drawing and disbursing officials along with a copy to the manager State Bank Of India, Ludhiana, had mentioned that PAU vice-chancellor had approved the grant of benefits to the pensioners. Katyal further stated that it was the efforts of the PAU vice chancellor Dr MS Kang that the Punjab CM had ordered the release of Rs 25 crore grant for the PAU pensioners. Living alone in an alien land is no more difficult especially for boys when it comes to cooking. One of my cousins who is presently in Canada had a tough time preparing his meals as he is an ardent lover of the Indian food. Surprisingly, when he returned to India from a vacation recently everybody was surprised at his culinary skills. He perfectly cooks panner, non-vegetarian dishes and all types of lip-smacking desserts as well. My worried aunt asked him if he has started working in a restaurant there to which he replied, no this is the wonder of learning cooking from websites. He is a regular visitor to sites by Tarla Dalal and Sanjeev Kapoor and today has become an expert cook. “I got bored eating burgers and pizzas while one day I was searching a place for Indian food on the Net I came across one of these sites and then thought why not to cook myself rather than driving all the way to an Indian restaurant. Today, everybody in India is enjoying the tasty dishes prepared by him and at last his mother also got a break from the kitchen all thanks to his dear son! The city residents, especially those commuting around the busy commercial areas like the Mall, College and Maharani Jhansi roads and Ghumar Mandi were at the receiving end as one of the feeders roads to the Fountain Chowk-the one from the Jagraon bridge-was closed for the traffic for more than three days for a religious function. Traffic snarls, exchange of hot words between the motorists caught in the traffic jam, wastage of man-hours and precious fuel, remained the order of the day throughout that period was closed at the orders of the senior civil and police officials. The practice of obstructing the roads in the name of dharnas, protests and on the top of its all religious functions like jagrans and shobha yatras seems to have become a routine as if causing inconvenience to the people will yield more “punya” to the organisers. The administration ought to take a tough stand and strictly prohibit the blocking of roads, whatever the provocation or the occasion. 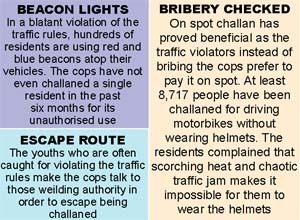 With 48,214 challans in nearly six months, city residents have yet again proved to be habitual traffic violators. The strictness against the traffic violators, following the launching of the Commissionerate system, has made the police department richer by Rs 11.16 lakh. Expressing concern a traffic cop said despite fining thousands of people for traffic violations and pocketing lakh of rupees, the problem refuses still persists. Beginning from driving car without wearing the seat belt to listening mobile phone while riding a motorbike, the Ludhianvis flout every rule at will. 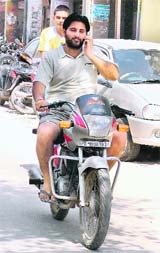 Three or at times even four persons could easily be spotted riding motorbikes on the city roads. Varinder Brar, who has recently taken charge of the ADCP (Traffic), said the police had challaned nearly 1,394 commuters for jumping traffic lights in 15 days alone. The traffic sense of the city residents could be gauged from the fact that 3,334 motorists have been fined for wrong parking till June. A traffic official said the number of challans for wrong parking would have been threefold if the cops dealt sternly for traffic violators in Sarabha Nagar, Ghumar Mandi and the Mall road. The residents of these areas are facing problems as shoppers often park their vehicle in front of their houses. Whereas, the commuters complain that the cops are soft on private bus operators and auto-rickshaws drivers who are regarded as the major contributors to the traffic chaos. Amit Behal, an insurance executive, said if the police used an iron hand against the private bus and auto-rickshaw drivers, it would be easy for it to manage the traffic. Additional Divisional Commissioner of the Police (ADCP) Varinder Brar said the police was trying hard to create a no-violation zone in the city. “In the first phase we have started the no-violation drive at the bus stand, Bharat Nagar and the Fountain chowks besides the mini secretariat. We would slowly increase our areas and make the entire city a no-violation zone,” he added. Dance lovers of the city have all reasons to cheer. Veteran Bollywood choreographer Saroj Khan has brought to the town her dance academy- Saroj Khan Dance Academy-which she herself inaugurated here yesterday. The academy has been set up in collaboration with the Dancing Spirits Institute of Performing Arts managed by Ruchi Bawa. With the opening of the academy in the city, the dance lovers will no longer have to rush to Mumbai to learn the dancing skills; they can get trained by Saroj Khan and her team here itself. Various dance styles like Bharatnatyam, bhangra, gidha, Bollywood, jazz, salsa, hip-hop, rock-n-roll, Natwari will be taught to the students with Bollywood being its main focus. Blend of other dance forms would be the core of the dance academy. Aspirants for various age groups would also be trained. Not only Saroj Kan’s assistants but she also would be training the students. She would be frequenting the city to monitor the performance of students. The reason for starting an academy in the city is to connect with its rich cultural heritage. The courses offered by the academy will be of three months to a year and can be extended up to three years for the learners. Certificates would be duly issued on the completion of the courses. After training, a person can look forward to start a dance school, participate in the realities shows or make a career in dancing, says Harpreet Singh, CEO, Leo One Productions. People continue to organise chhabils and langars on highways and roads despite the fact that the practice has claimed a number of precious lives during the past several years. The recollection of gory and unfortunate incidents in which volunteers, including children, were crushed to death by speeding vehicles has set off a debate on the practice projecting generosity of Punjabis. While a few intellectuals feels that perhaps Punjab is the only state where people forcibly stop you, not to harm but to make you eat and drink which can sometimes go beyond your capacity; others maintain that youths have become mechanical and stopped respecting the institutions of the langar and the chhabil in letter and spirit. However, most of them are of the view that organisers of langars and chhabils should not forcibly stop passersby and make them eat and drink. A large numbers of langars, organised along the route of various nagar kirtans and other religious processions, besides reflecting the devotion of the Punjabis in general and the Sikhs in particular, had darkened the future of many families. Residents of Gujjarwal village here had to reserve their comments after they lost one of their senior citizens and former state-level kabaddi player Jaswinder Singh at one such langar a few years ago. Jaswinder Singh, who worked as a PRTC bus driver in Chandigarh depot, was allegedly stopped and mercilessly thrashed by sevadars at a langar organised at Salani village near Amloh in December 2004. On that fatal day he was going to Malerkotla. Jaswinder Singh had succumbed to his injuries while on the wheels. However, the alert bus conductor averted a major tragedy as the bus about to ram into a tree. Money, a four-year-old child, was crushed to death by a bus during a chhabil organised at Mandiani village about two years ago. He had reportedly come to for drinking sweetened water but died for no fault of his. Six persons, including four children, were crushed to death when a speeding truck had hit a chhabil organised at Sayan village on the Ahmedgarh-Ludhiana road near here three years ago. Chairman of the Global Punjab Foundations Harjinder Pal Singh Walia said the attitude of sevadars at most of the langars and chhabils had drastically changed during the past decades. Instead of politely requesting the occupants of the vehicles to stop for partaking langar and sweetened water, groups of youngsters usually equipped with sticks block the road and forcibly stop every vehicle and make them “relish” the preparations that they do not need. “The Sayan tragedy also seems to be outcome of negligence on the part of the truck driver as well as organisers. Had organisers chosen a place slightly away from the main road the tragedy could have been averted,” argued Walia while asserting that drivers usually get irritated on being frequently stopped on highways. Drug addiction is not merely a social evil in this part of Ludhiana district; it has since been transformed into an epidemic for which there seems to be no prevention or cure. Parents, predominantly illiterate rural folks, are so disappointed that some of them have starting considering their wards as non-existent. Girls are no more an exception to lists of addicts. Taking cognizance of the situation the Ludhiana police has launched crusade against the menace. Besides roping in the social, educational and religious organisations for educating masses about hazardous affects of addiction, drug de-addiction camps are being organised in the rural part of the district. Most of the addicts happen to be agricultural labourers, masonry helper and transporters besides youths, including students and girls. “Having failed to mend habits of my son I have now starting preparing my wife for the ultimate result. I know he cannot survive for a long time, in case he continues to consume drugs and narcotics. As I have already considered him dead for my family, I hand him over to you for any experiment regarding de-addiction,” a farmer broke when he was asked to send his addict son to a de-addiction camp to be organised by the police at Ludhiana. Referring to information received from addicts and their parents during the drug de-addiction awareness camp at Sarinh village, Narinder Singh Ruby, ACP, Ludhiana, regretted that number of addicts had drastically increased during the past several years. Organisers were shocked to learn that addicts included a large number of girls too. At least 25, out of the 50 addicts had consented for de-addiction treatment according to the alternative system of medicine. Worried over the gravity of the situation, Surinder Kumar Sharma, social activists from local town, admitted that he had seen some schoolgirls taking cough syrup. The chaos and nuisance due to the ongoing construction work on one of the ramps of Lakkar Bridge at Bhadaur House, opposite the AC Market, continue to bother commuters. However, neither the civic body nor the traffic police seem to be interested in finding a solution to the problems of the general public. The situation of traffic on this already congested road has worsened due to the road blockade by the men at work, but the authorities do not care to find solution. For the past two-three months, it has virtually become impossible to pass through this main road, which connects Mata Rani Chowk. It takes at least 30-40 minutes to pass through this small stretch. About 70 per cent of around 30 feet road, just opposite Calibre Plaza, has been covered for the construction work, while other 4-5 feet road gets blocked by the haphazardly parked two-wheelers. The commuters in four-wheelers, autos, rickshaws pass through narrow path, causing damage to each-others' vehicles. Following this, road-rage become the order of the day. "We are left with no other option but to abuse each other daily. The entire road is in a shambles. Neither the tehbazari wing of the MC impounds these wrongly parked vehicles nor the traffic police does it a one-way for traffic. The higher-ups cannot understand our problems unless they visit the site themselves. Passers-by scream at each other due to frustration," said Ajay Kumar, who works at an office near Bhadaur House. Taking further advantage of this situation, the shopkeepers in the AC market and nearby area have started putting their huge stocks of dress-material on the path-ways itself. "Also, the pathways have been encroached-upon by vendors selling eatables. Starting from morning till late evening, these pathways get blocked always. Had the authorities given it proper attention, things would have been streamlined. I don't know for how long we will have to suffer like this," said Jaimal Singh, an employee in a hotel at Bhadaur House. A function in connection with the celebration of Fathers' Day was organised at the Swami Vivekanad Vridh Ashram, which was presided-over by Ram Parkash Bharti, chairman of New Hope, an NGO. Speaking on the occasion, New Hope president NS Nanda spoke on the importance of the day and appealed to youngsters to serve their parents with love and affection. UCO Bank today celebrated its 67th foundation day and organised a bank's mega retail credit camp. KP Brar, Assistant Commissioner, Municipal Corporation, was the chief guest on the occasion. The main objective of the retail camp was to disburse loan to businessmen, personal loan to employees, education loan to students and housing loan to needy families for their shelter at competitive rate. During the retail mega camp, the bank has disbursed about Rs 20.00 crore to 400 borrowers. Cheques and sanction letters was handed over to the borrowers by the chief guest. A married woman died after consuming some poisonous substance at her home in Sarabha village yesterday. Pooja (20), a resident of Shimla Puri, had got married to Rohit Sukhia, a migrant labourer, who lives in shanties at Sarabha village. She leaves behind a nine-month-old baby boy. Yesterday, she expressed her desire to visit her parents house in Ludhiana. Her husband went to his employer, who runs a poultry farm nearby, to borrow some money. When he returned at around 12 noon, he found her laying unconscious on the floor. Nobody was at home when this incident took place. People were busy transplanting paddy in the fields. He along with neighbors took her to Sarabha hospital. The doctors after administering first aid referred her to Ludhiana civil hospital as her condition was deteriorating very fast. When they took her to Ludhiana, the doctors there declared her bought dead. Sudhar police has lodged a case under Section 174 on the statement of her husband and handed over the body to the family after getting the post-mortem examination conducted. The Sidhwan Bet police yesterday booked a baba for cheating his follower to the tune of Rs 7.5 lakh on the pretext of sending her and her family abroad. Surjit Kaur of Leelan Megh Singh village in her application to SSP Ludhiana (Rural), Harinder Singh Chahal, had stated that she used to visit Rohit Kumar, who occupied the place of the head priest of ‘Dargah Panj Peer’ at Kulgahna village near Bhundri to get her domestic dispute settled. During on such visit she asked baba to arrange for her immigration to Canada as many of his followers were settled there. A deal was stuck at Rs 7.5 lakh for sending her, her husband Amarjit Singh and her son to Canada. She paid the entire amount to baba on November 21, 2000. After this, the baba started avoiding her. Later on, he sought more time for completing the formalities. When she demanded the money back she was threatened. Though eight years have passed and numerous investigating officers have changed but nothing concrete has come out of it. Now, the SSP has entrusted the in-charge of the enforcement wing, Jagraon, to probe into the case. Allegations levelled by Surjit Kaur against the self- proclaimed baba were found to be correct. On the basis of the inquiry report, an FIR was registered against the accused under Section 420 and 406 of the IPC. The Jagraon police has booked two persons for selling the tractor of a complainant on the basis of fake documents yesterday. Avtar Singh of the Kother Baggu area has complained to the Jagraon police that they were three brothers and owned the tractor jointly. His brother Hardeep Singh had settled in Manawa village near Kot Issekhan of Moga. He complained that his brother Hardeep Singh took the tractor to Manava village for the purpose of cultivation, as he was a co-sharer in it but he along with his son Manjinder Singh disposed off the tractor to some unidentified person after forging the registration certificate of the tractor. The Raikot police has booked three members of a family for dowry harassment. 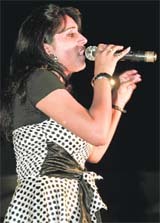 Ramandeep Kaur, now staying with her parents at Bhaini Baringa village near Raikot in her statement to the Raikot police had stated that she was married to Santokh Singh of Dharoor village near Sahnewal on March 4, 2007 and her parents gave enough dowry to her as demanded by her in-laws at that time. Soon after the marriage, her in-laws, including her husband, his mother Pritam Kaur and his brother Hardev Singh started harassing her for bringing in inadequate dowry. They asked her to bring Rs 50,000 in cash from her parents. In October 2007 when she was expecting a child, her in-laws sent her to her parents and then never came to take her back. They said that they would take back Ramandeep only after her parents paid them Rs 50,000 in cash. She was blessed with a baby girl. The issue was also taken up at panchayats but a compromise could not be reached.